Absinthe (Wormwood) is native to Europe, Siberia, North Africa and has been naturalized in North America. In England, the plant grows in many places and appears to thrive near the sea. It is a perennial root, which arises to a height of two to four feet with leafy, flowering stems. The leaves and flowers are extremely bitter, with the characteristic odor of thujone, and the whitish plant is closely covered with fine, silky hairs. Grande Absinthe has a bitter taste and contains high concentrations of the oily substance called thujone that is responsible for the unusual effects of absinthe. In France, Switzerland and the lands of Bohemia, absinthe was traditionally as an elixir that helped to relieve the stresses of the day. The Absinthe fruit is a small achene; seed dispersal is by gravity. It grows naturally on uncultivated, arid ground, on rocky slopes, and at the edge of footpaths and fields. The Absinthe plant can easily be cultivated in dry soil. Absinthe should be planted under bright exposure in fertile, mid-weight soil and it prefers soil rich in nitrogen. It can be propagated by growth (ripened cuttings taken in March or October in temperate climates) or by seeds in nursery beds. Absinthe is naturalised in some areas away from its native range, including much of North America. Absinthe has long been used by herbalists to eliminate worms and parasites, including pinworms and roundworms, as well as an aid for helping to improve gallbladder, liver, gastric and vascular disorders, as well as migraine headaches. Applied topically, it helps heal wounds, skin ulcers, blemishes and insect bites. As an natural tranquilizer, Absinthe may help to calm the nerves, and as a uterine stimulant, it may also help to induce menstruation. Long used in the preparation of alcoholic beverages (absinthe), Absinthe is a fine digestive that helps to pep up appetite and relieve many digestive disturbances. Absinthe is a wild plant of European origin, although it now grows in many parts of the United States as well. Absinthe has a long medicinal history; it has been used since the times of the Romans to treat a variety of complaints, especially digestive ones. The plant is also known to stimulate appetite. 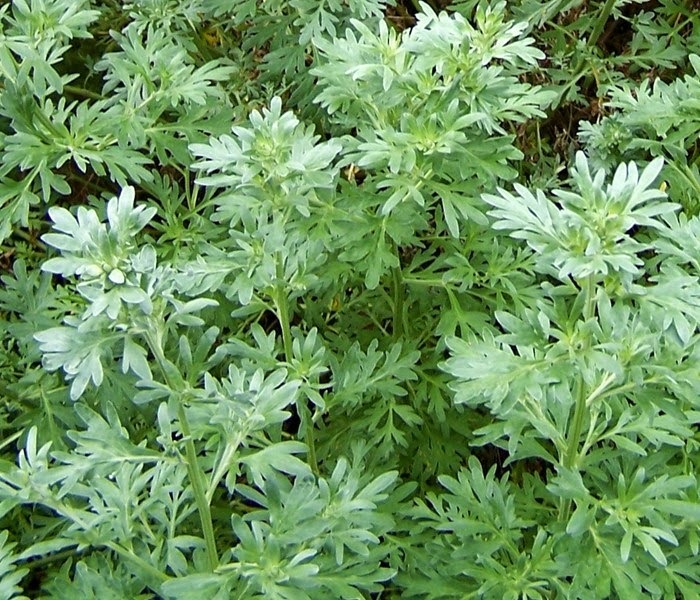 In the middle ages—before there was liquor-based absinthe—wormwood-infused wine was a popular drink. However, absinthe was associated with cases of serious toxicity and was banned from many places in the early 1900s. Absinthe's medicinal use continues today, but there is insufficient scientific information to support its efficacy for any use. Consult with your physician before using Absinthe (Wormwood)medicinally. Absinthe (Wormwood) has been used as a powerful tool to fight worm (notably intestinal pinworms and roundworms) and other parasitic infestations in humans and animals. It has long been used as an anthelmintic or agent that expels intestinal worms and parasites. 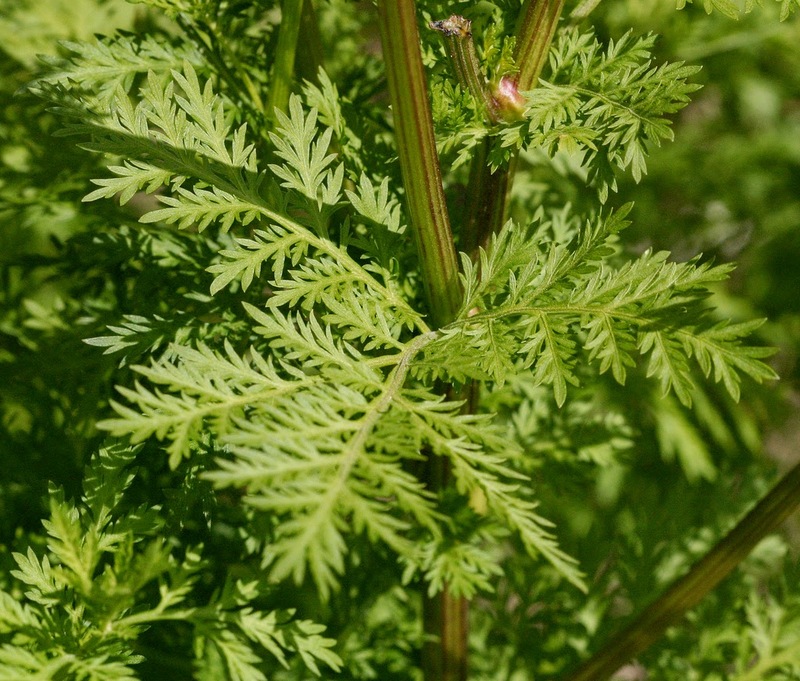 Research introduced at the University of York (UK) in 2008, indicated that because of increasing parasite resistance to anti-malarial drugs, there is now great reliance on a new drug, Artemisinin, to treat malaria, which is based upon the plant compounds in Absinthe. Used as a 'bitter,' Absinthe aids in secretions of the galbladder and liver and is an old and trusted traditional remedy (when used properly) for biliousness and liver troubles, jaundice and gallbladder ailments. Absinthe is regarded as a nervine tonic that is said to nourish the nervous system and, thus, work to ease stress and nervous disorders. The herb acts as an herbal sedative that calms and soothes nerves and reduces tension and anxiety. The herb's absinthin content is a narcotic analgesic that affects the medullary portion of the brain concerned with anxiety and is said to induce a relaxed state. Well known for its commercial use in the preparation of liquors, notably absinthe and vermouth, Absinthe has also been used medicinally as a mild sedative. This bitterest of herbs includes a narcotic analgesic that affects the portion of the brain dealing with pain. If not used habitually, the herb's absinthum, a narcotic analgesic, has been known to stimulate the cerebral hemispheres and act as a direct stimulant on the cortex cerebri, aiding in the relief of migraine headaches, nervous diseases and pain, in addition to soothing nervous temperament. Due to the slight natural anesthetic effect of this herb it has been used to ease pain associated with arthritis and rheumatism. Because of the bitter properties of Absinthe it stimulates appetite and explains why it has sometimes been used to treat anorexia. Absinthe is thought to have calming effect and could be helpful to those suffering from epilepsy and muscle spasms and to treat mild forms of depression. Traditional herbalists claim that Absinthe is a febrifuge that can lower intermittent fevers and fight infection. Because Absinthe increases stomach acidity, it aids in the whole digestive process, particularly when there is a deficiency of gastric juice. It has been used to help alleviate gastritis, stomachache, bloating and flatulence. Absinthe has been used as a traditional remedy to promote menstruation by improving blood circulation, is a uterine stimulant and is said to help induce and control irregular menstrual cycles (and thus, should not be used by pregnant women). Applied topically, the oil extracted from Absinthe acts as an anti-inflammatory that is used as a liniment to relieve pain and sore muscles. It is useful for healing wounds, skin ulcers, blemishes and insect bites. Absinthe may also be used as an organic insect repellent when sprayed on organic gardens or when prepared as a sachet to keep moths from clothing. 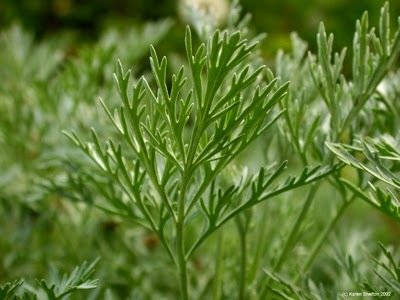 The use of Absinthe (Wormwood) as a medicinal herb should not exceed four weeks. Because of thujone found in this herb it is considered unsafe if taken in large amounts over long periods of time (over four weeks). Excessive use can cause stomach and intestinal cramps, vomiting, nausea, dizziness, headaches and nerve damage.Women who are breastfeeding or pregnant should not take Absinthe in any form. Those who are sensitive to plants in the Asteraceae family can get allergic reaction to Absinthe. Plants in this family include marigolds, daisies and ragweed to name a few. People who are on drugs (Anticonvulsants) used to prevent seizures should not use Absinthe as it may interact with those medication. Absinthe should only be taken under the guidance of a professional health care provider who is knowledgeable in herbal medicine. Absinthe can be found both offline and online and is mostly commonly sold by noted herbalists or natural food shops in bulk. By buying in bulk, you have a better chance for saving per bundle. Also, concentrated tinctures can be purchased online or in food stores as well. The going cost for bulk Absinthe, whether they be organic, dried, or mixed ranges from about $4 to $10 dollars and is most commonly sold in concentrated tinctures. Most are infused with pleasing flavors such as walnut or peppermint to mask the bitterness. It may also be found in capsulated forms at any store that contains a generic vitamin aisle. Absinthe is fairly inexpensive and can even be grown in a simple herb garden for an enthusiast and it is the best way to access fresh Absinthe during its optimal growing season which is mid-summer, specifically June to August when the herb is picked and dried. As always, it’s best to consult a health care professional or someone who has expert knowledge in the consumption of herbs as a means of holistic medicine. As with several herbs, Absinthe may have adverse side effects, such as diarrhea, nerve damage (with excessive use) and moderate to heavy sedation. If any of these side effects persist, you should stop consumption of the herb immediately. Though most commonly associated with the French spirit, Absinthe (due to its active ingredient of absinthol) , Absinthe was most traditionally used in brewery’s instead of hops until the FDA deemed the presence of such ingredients like thujone to be ‘unsafe’ for public consumption. It is available for whole sale purchase at most health food stores in the form of capsules and concentrated tinctures. It is also simple to grow Absinthe and is best harvested in May or June; early summer.